In today’s lean, fast-changing world, traditional business practices are being shaken up. Many companies are reviewing their long-held traditions in favor of more agile, responsive ways of improving the employee experience. They are giving more consideration to the physical environment employees work in as well as the practices, technologies and tools that encourage productivity. Changes include providing employees with flexibility to work from home more often, and leveraging technology like Skype for Business or Yammer to better communicate and share information among team members, and even the entire organization. The long-standing practice of annually evaluating employees based on their productivity, overall improvement and achievement of goals is one of the areas undergoing a big transformation. For decades, the prevailing wisdom has been that one annual review at the end of the year is enough to let employees know how they're doing. However, this is no longer true - employees are demanding more frequent and detailed feedback on their performance, and managers are responding by making their review practices more flexible and engaging. 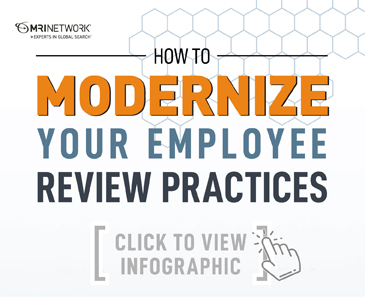 According to the 2018 MRINetwork’s Performance Management Study, 54 percent of employers say they are increasing their focus on performance reviews, which indicates that they recognize the need to find better ways to enhance the value of the reviews, as well as their employees’ perception of the process. The same study revealed that 42 percent of candidates disagree or strongly disagree that their company’s review process is useful and productive. If your company hasn't updated its performance review practices, it runs the risk of losing top talent to competitors that build regular feedback into their business functions. You’re also missing out on valuable opportunities to identify and develop your employees' professional skill sets. The performance review plays an integral role in keeping the line of communication open between manager and employee. It is the chance to offer employees the acknowledgment that they’re looking for, to encourage them to strive for higher levels of achievement, and to nip problems in the bud. Instead of saving comments for the annual review, find ways to provide feedback and discuss priorities with employees on a regular basis. Consider holding biweekly, one-on-one check-ins with employees, discuss goals or accomplishments at the beginning or end of each quarter, or provide opportunities for group discussions at weekly team meetings. Regular check-ins help employees feel that their managers are committed to helping them be successful workers, which in turn means they’re more engaged and motivated to do their best work. Career pathing is a strategy that actively invests in and develops your employees to thrive in their current and future roles. It is an intentional approach as opposed to a reactive one - instead of managers passively learning of an employee's goals at the company, they take a participatory role in professionally developing the individual. Through career pathing, managers and employees sit down and discuss the employee's professional aspirations at the company and then set a tangible plan for helping the employee reach these goals. Reviews that benefit both the employee and the employer are based on honest, open communication, and this is only possible when there is a culture of workplace transparency. Employees should feel comfortable expressing their concerns, and criticism should be communicated in a way that is constructive. If employees feel that they are always one misstep away from being fired, or that their managers are not honest with them, reviews are more likely to further cement negative feelings instead of paving the way for constructive performance augmentation. Company leadership can do their part to create an open culture of feedback by keeping employees in the loop on workflow changes, encouraging employees to voice their concerns and recognizing workers who aren't afraid to ask for help. Performance reviews are integral to employee success, but expectations have changed in the 21st century. Employees want reviews that are frequent, constructive, authentic and fair. Companies that update their review processes to match these needs are most likely to retain top talent because better performance reviews lead to higher morale, higher efficiency and overall, a better company in which to work.